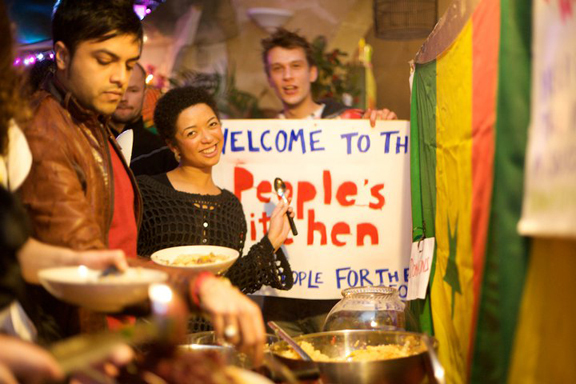 After a great night on Wednesday in the Barley Mow on Curtain rd where 5 awesome projects presented, we’re thrilled to give January’s Awesome London award to The People’s Kitchen. Steve and the rest of the PK gang aim to draw attention to the tonnes of perfectly good food that is thrown away every day from supermarkets, restaurants and homes. They collect great food that is past its sell by date from local shops, and every sunday in their kitchen in Passing Clouds in Dalston, the first 20 people that turn up (they’re always oversubscribed) cook a big meal together for the first 50 – 100 people that turn up to eat. Again, it’s so popular they’re always oversubscribed. They believe that cooking and eating together is a great way to build community, and we LOVE that idea. They’ll use the award to buy some bigger and more robust kitchen equipment so that they can expand the variety of the dishes they can cook. Yum Yum! The People’s Kitchen gang are also developing it as a fantastic event that can be replicated and scaled, because of course like the Awesome Foundation, this could work in any community. They’ve had some great media interest already which is not surprising considering the huge potential of this. If you feel like starting a People’s Kitchen in your neighbourhood, get in touch with Steve at their Facebook page here.